If three keyly committed core components of the counter-cultural community say “in terms of” 105 times in an hour, how many times will one keyly committed core component of the counter-cultural community say “prior to” in terms of 23 minutes? • All O.o.t.Ü.-F. posts engaging issues around I.T.O. Γκροτεσκο, ώμο, βίαιο… Σε υπερθετικο βαθμό. Δοκιμαστηκαν οι αντοχές μου και η ανοχή μου. Δεν ξέρω εάν είναι αυτοβιογραφικο, εάν είναι κριτική στον σύγχρονο τρόπο ζωής ή απλά το πόνημα ενός σαδιστη ψυχοπαθους. Οποια και εάν είναι η απάντηση, η ανάγνωση αυτού του βιβλίου χρειάζεται κότσια, γερό στομάχι και αποστασιοποιηση. Translation: Grotesque, shoulder, violent … in the superlative degree. They tested my strength and my tolerance. I do not know if it’s autobiographical, if criticism of modern lifestyle or simply the essay a sadistic psychopath. It is the look of the author in foursomes or what they saw his eyes? Whatever the answer, read this book takes guts, a strong stomach and detachment. 2.5 the stars, thanks Rounding became three. Αν το πάρει κανείς κυριολεκτικά είναι πραγματικά… απαίσιο! Αυτό βέβαια είναι, κατά την γνώμη μου, η επιφανειακή κριτική. Λογοτεχνικά, ο μυστηριώδης αυτός συγγραφέας είχε να δώσει πράγματα καθώς τόσο οι περιγραφές όσο και οι εικόνες που δημιουργεί είναι δείγμα λογοτεχνικής δεξιοτεχνίας. Φυσικά, κανείς δε προσπερνά το άρρωστο του νοήματος. Translation: If you get literally is really … horrible! This of course is, in my opinion, the superficial criticism. Literature, the mysterious writer he had to give things as well as descriptions and images created are literary virtuosity sample. Of course, no one overtakes the sick of meaning. It is worth to read (if you have a strong stomach) and you will see that literature is better than the “Philosophy in the Boudoir” Marquis and approaches the “Story of the Eye” of Z.Mpataig. Strictly for adult and ormo public! Auberon Waugh called himself a “practitioner of the vituperative arts”. Perhaps it was a Catholic thing. And unless you know Latin, you won’t understand. Or you won’t understand as much as you might. 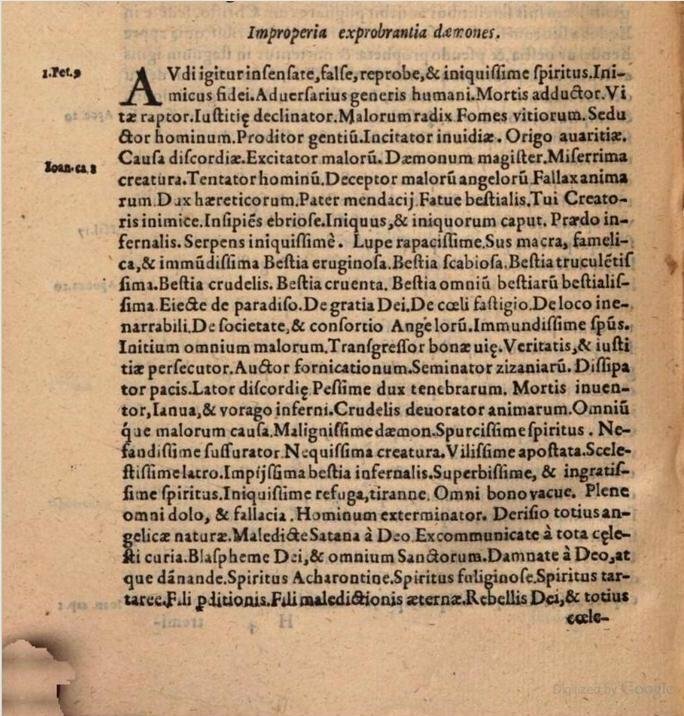 I don’t know Latin well, but I can appreciate some of the wonderful vituperation in a book of Latin exorcisms I’ve found scanned at Google Books. The title alone is good: Flagellum Daemonum: Exorcismos Terribiles, Potentissimos et Efficaces, which means (I think) The Flail of Demons: Exorcisms Terrible, Most Potent and Effective. Or is the title Fustis Daemonum: Adiurationes Formidabiles, Potentissimas et Efficaces, meaning The Cudgel of Demons: Adjurations Formidable, Most Potent and Effective? Either way, one of the exorcisms contains a good list of curses directed at the Devil. He’s called Bestia Omnium Bestiarum Bestialissima, meaning “Beast of All Beasts the Most Beastly”. Beside that, there are Dux Hæreticorum and Lupus Rapacissimus, “Duke of Heretics” and “Most Rapacious Wolf”. There’s an odd Sus Macra, Famelica, et Immundissima, which means something like “Scrawny, Famished and Most Filthy Hog”. Lovecraft would have liked Nefandissimus Susurrator, “Most Unspeakable Whisperer”, and Draco Iniquissimus, “Most Iniquitous Dragon”. Audi igitur insensate, false, reprobe, et iniquissime Spiritus. Inimice fidei. Adversarie generis humani. Mortis adductor. Vitæ raptor. Justitiæ declinator. Malorum radix. Fomes vitiorum. Seductor hominum. Proditor gentium. Incitator invidiæ. Origo aravitiæ. Causa discordiæ. Excitator malorum. Dæmonum magister. Miserrima Creature. Tentator Homininum. Deceptor malorum Angelorum. Fallax animarum. Dux Hæreticorum. Pater Mendacii. Fatue Bestialis. Tui creatoris Inimicus. Insipiens ebriose. Inique et iniquorum caput. Prædo infernalis. Serpens iniquissime. Lupe rapacissime. Sus macra, famelica, et immundissima. Bestia eruginosa. Bestia scabiosa. Bestia truculentissima. Bestia crudelis. Bestia cruenta. Bestia omnium Bestiarum Bestialissima. Ejecte de Paradise. De gratiâ Dei. De Cœli fastigio. De loco inerrabili. De Societate et consortia Angelorum. Immundissime Spiritus Initium omnium malorum. Trangressor bonæ vitæ. Veritatis et Justitiæ persecutor. Auctor fornicationum. Seminator zizaniarum. Dissipator pacis. Latro discordiæ. Pessime dux tenebrarum. Mortis inventor. Janua et vorago Inferni. Crudelis devorator animarum omniumque malorum causa. Malignissime Dæmon. Spurcissime Spiritus. Nefandissime susurrator. Nequissima Creatura. Vilissime apostata. Scelestissima latro. Impiissima bestia infernalis. Superbissime et ingratissime Spiritus. Iniquissime refuga. Tyranne, Omni bono vacue. Plene omni dolo et fallaciâ. Hominum exterminator. Derisio totius Angelicæ Naturæ. Maledicte Satana a Deo. Excommunicate a totâ cœlesti curiâ. Blaspheme Dei et omnium Sanctorum. Damnate a Deo atque Damnande. Spiritus Acherontine. Spiritus Tartaree. Fili Perditionis. Fili maledictionis æternæ. Rebellis Dei et totius cœlestis curiæ. Serpens crudelissime. Draco iniquissime. Creatura damnata, reprobata et maledicta a Deo in æternum ob superbiam nequitiam tuam. The first line, Audi igitur insensate, false, reprobe, et iniquissime Spiritus means something like “Hear, then, Senseless, False, Reprobate and Most Iniquitous Spirit”. Then the Devil is called Inimicus Fidei, “Enemy of the Faith”, Adversarius Generis Humani, “Adversary of the Human Race”, Mortis Adductor, “Dragger to Death”, and Vitæ Raptor, “Snatcher of Life”. Then the vituperation really begins. Voyeurism is the opium of the peephole.